The plaintiff is seeking damages in the amount more than $15,000. She is seeking to hold the defendant responsible for her injuries, claiming that Walmart should have known that the cart was in the way, and made some effort to remove it. Because she was forced to go around the cart, she tripped and fell. In the vast majority of personal injury cases, the question of negligence determines if the case is successful or not. As a litigator, the job of the plaintiff’s attorney is to prove that the defendant’s lack of foresight or carelessness resulted in the injury to their client. In order to do that, the plaintiff’s attorney must prove constructive knowledge of the potential hazard. 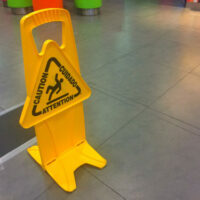 Essentially, the business owner, manager, or some of the store’s employees would have to know beforehand of the potential danger. An obvious question is: how do you prove that someone knew or didn’t know about a potential hazard? Constructive knowledge can be proven circumstantially. For instance, the plaintiff’s attorney can argue that the obstruction or hazard was there for an extended period of time and that the defendant should have known and remedied the situation. Another way to prove circumstantial knowledge is that the event that caused the accident occurred regularly and that, therefore, the defendant should have foreseen this kind of problem and prevented it. In this instance, it is more likely that the plaintiff will argue that carts left behind in aisles is a regular occurrence at the majority of Walmart stores. The store should have known that this presented a potential hazard and removed the cart from the aisle where it caused this woman’s injuries. Florida is also a state in which comparative negligence can determine that the premises owner and the injured party are partially at fault. For instance, if the woman attempted to squeeze through the aisle around a cart that was clearly in the way, then she may bear some of the blame for the accident. In addition, Florida has something called the “Open and Obvious Doctrine”. That means that when an individual is injured by their own lack of observation, a judge can make the determination that the owner is not liable for the damages. This is very rarely employed, however, which means the case is likely to be decided by a jury. The jury will then determine the extent of the woman’s liability for not avoiding the cart and assign some of the blame to Walmart for leaving the obstruction where it didn’t belong. If you have been injured by the negligent acts of someone else, we can help. Reach out to the office of Alan Goldfarb, P.A today. We’ll begin discussing your case and potential avenues for collecting damages.